This paper aims to present data analysis of quadcopter dynamic attitude on a circular trajectory, specifically by comparing the modeling results of conventional Proportional Integral Derivative (PID) and Fuzzy-PID controllers. Simulations of attitude stability with both control systems were done using Simulink toolbox from Matlab so the identification of each control system is clearly seen. Each control system algorithm related to roll and pitch angles which affects the horizontal movement on a circular trajectory is explained in detail. The outcome of each tuning variable of both control systems on the output movement is observable while the error magnitude can be compared with the reference angles. To obtain a deeper analysis, wind disturbance on each axis was added to the model, thus differences between each control system are more recognizable. According to simulation results, the Fuzzy-PID controller has relatively smaller errors than the PID controller and has a better capability to reject disturbances. The scaling factors of gain values of the two controllers also play a vital role in their design. Ahmed S.F. et al (2015); Attitude Stabilization of Quad-rotor (UAV) System Using Fuzzy PID Controller, Second International Conference on Computing Technology and Information Management (ICCTIM), 99-104, 2015. Argentim L. M. et al (2013); PID, LQR and LQR-PID on a Quadcopter Platform, International conference on Informatics, Electronics and Vision (ICIEV), 1-6, 2013. Benic Z. et al (2016); Mathematical Modeling of Unmanned Aerial Vehicles with Four Rotors, Interdisciplinary Description of Complex System Journal, 14, 88-100, 2014. Bolandi H. et al (2013); Attitude Control of a Quadrotor with Optimized PID Controller, Intelligent Control and Automation Journal, 4(3), 335-342, 2013. Cai G. et al (2014); A Survey of Small-Scale Unmanned Aerial Vehicles: Recent Advances and Future Development Trends, Unmanned System Journal, 2, 1-25, 2014. Du Z.B., Lin T.C., Zhao T. B. (2015); Fuzzy Robust Tracking Control for Uncertain Nonlinear Time-Delay System, International Journal of Computers Communications & Control, 10(6):812-824, 2015. Fu C. et al (2013); UAS See-And-Avoid Strategy using a Fuzzy Logic Controller Optimized by Cross Entropy in Scaling Factors and Membership Functions, International Conference on Unmanned Aircraft System (ICUAS), 532-541, 2013. Gautam D., Ha C. (2013); Control of a Quadrotor Using a Smart Self-Tuning Fuzzy PID Controller, International Journal of Advanced Robotic Systems, 10:1-9, 2013. He Z., Zhao L. (2014); A Simple Attitude Control of Quadrotor Helicopter based on Ziegler- Nicols Rules for Tuning PD Parameters, The Scientific World Journal, 1-13, 2014. Kotarski D. et al (2016); Control Design for Unmanned Aerial Vehicle with Four Rotors, Interdisciplinary Description of Complex System Journal, 14(2), 236-245, 2016. Lai J.G. et al. (2016); A New Adaptive Fuzzy PID Control Method and Its Application in FCBTM, International Journal of Computers Communications & Control, ISSN 1841-9836, 11(3):394-404, 2016. Magnussen O. et al (2013); Experimental Validation of a Quaternion-based Attitude Estimation with Direct Input to A Quadcopter Control System, International Conference on Unmanned Aircraft System (ICUAS)l, 480-485, 2013. Mian A., Wang D. (2008); Modeling and Backstepping-based Nonlinear Control strategy for a 6 DOF Quadrotor Helicopter, Chinese Journal of Aeronauticsl, 21, 261-268, 2008. Moghaddam H. F., Vasegh N. (2014); Robust PID Stabilization of Linear Neutral Time- Delay System, International Journal of Computers Communications and Control, 9(2):201- 208, 2014. Patel K., Barve J. (2014); Modeling, Simulation and Control Study for The Quadcopter UAV, The 9th International Conference on Industrial and Information Systems (ICIIS), 1-6, 2014. Sanchez E.N. et al. (2006); Combining Fuzzy, PID and Regulation Control for an autonomous mini helicopter, Information Sciences Journal, 177:1999-2022, 2006. Seidabad E.A. et al. (2014); Designing Fuzzy PID Controller for Quadrotor, International Journal of Advanced Research in Computer Science and Technology, 2:221-227, 2014. Stevanovic S. et al (2012); Robust Tracking Control Of A Quadrotor Helicopter Without Velocity Measurement, Annuals of DAAAM for 2012 and Proceedings of the 23rd International DAAAM Symposium, 595-600, 2012. 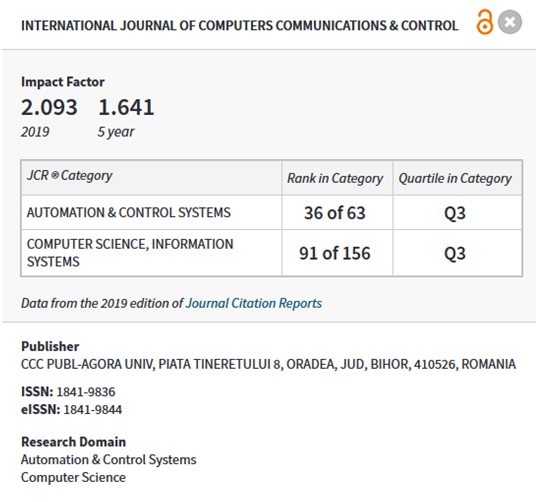 Susnea I.; Vasiliu G. (2016); A Fuzzy Logic Software Tool and a New Scale for the Assessment of Creativity, International Journal of Computers Communications & Control, ISSN 1841-9836, 11(3):441-449, 2016. Xu, H.; Vilanova, R. (2015); PI and Fuzzy Control for P-removal in Wastewater Treatment Plant, International Journal of Computers Communications & Control, ISSN 1841-9836, 10(6):936-951, 2016. Yang, S. et al (2009); Design and Simulation of the Longitudinal Autopilot of UAV Based on Self-Adaptive Fuzzy PID Control, International Conference on Computational Intelligence and Security, 634-638, 2009. Ziegler J. G., Nichols N. B. (1942); Optimum Settings for Automatic Controllers, Transactions of the American Society of Mechanical Engineers, 64:759-768, 1942.